This spacious, functional and durable sling backpack is being manufactured by high quality water resistant nylon material. Multi main compartment with many size pockets can fit your various supplies and stationeries. The shoulder strap can be switched to the either side using the D rings located at the bottom of either corner, and it feels comfortable whether worn on the front, back, or cross body. This bag could definitely come in handy for day trips to theme parks, to take to the gym, the pool, or when biking or hiking. 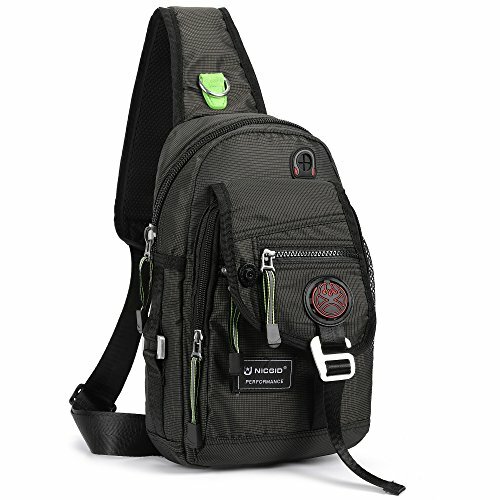 It's a great sling backpack for working, gym, traveling, biking, running, hiking, camping, school and everyday using. BUY CONFIDENTLYwith our 100% Money Back Guarantee - If for any reason you are not satisfied with our product you will receive a full refund no questions asked and hassle free. If you need help or have any question, feel free to contract us. Our customer service team will reply you within 24 hours and offer you our best services. Material--lightweight,high quality and water-resistant nylon material.Strap and the back are padded, comfortable to wear carry-on. Dimension--Size:8.3*3.9*11.8 inch (L*W*H). It is can used as a chest pack, shoulder bag, messenger bag ,travel bag. Fit both regular and plus-size person. Internal--The large compartment with a small Ipad inner pouch fit camera,umbrella,textbooks or even a lightweight jacket. A eraphone hole connected to outside. Exterior--3 zip pockets on the front,1 large deep pocket on the back,1 meshy side bottle pouch fit all your needs. Practical--Great for Excursion ,travel ,hiking, mountaineering,leisure or outdoor living and sports. Or trips to the amusement park, diaper bag (carry around diapers and wipes). If you have any questions about this product by Nicgid, contact us by completing and submitting the form below. If you are looking for a specif part number, please include it with your message.